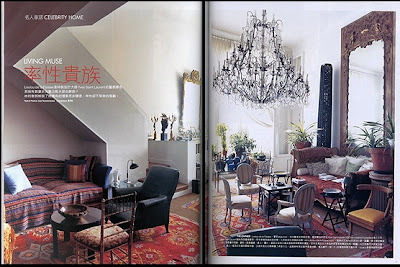 Janet de Botton's home as seen in Vogue Living: Houses, Gardens, People, published by Knopf 2007. Unidentified room seen in Domino, December 2008. 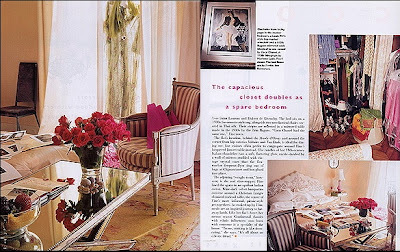 For everyone who's a genuine fan of the embroidered pieces -- or just spent a small fortune on one -- I thought I'd share a few supremely timeless rooms with suzanis draped on tables. 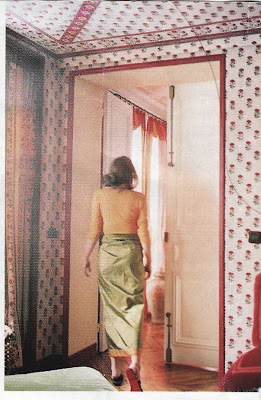 Carolina Herrera, Jr. also loves textiles; Above, her Madrid bedroom photographed by Eric Cahan for Domino, spring/summer 2005. 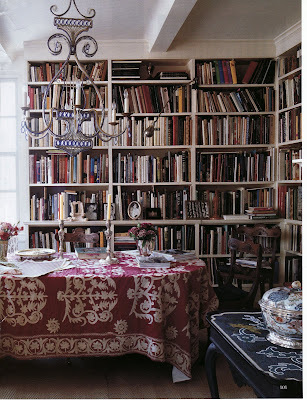 Carolina Irving's dining room photographed by Simon Upton for World of Interiors, September 2007. 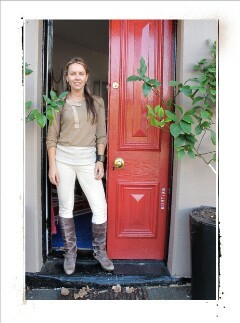 See also Carolina Irving Textiles. 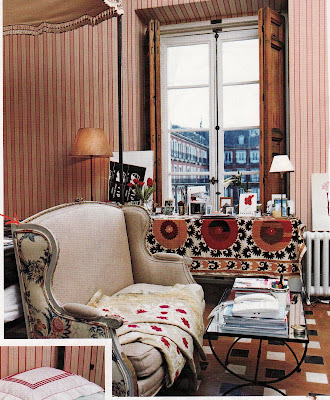 Some of you may know that I'm a little obsessed with textile designer Lisa Fine's Paris apartment. (Glamorous meets exotic.) 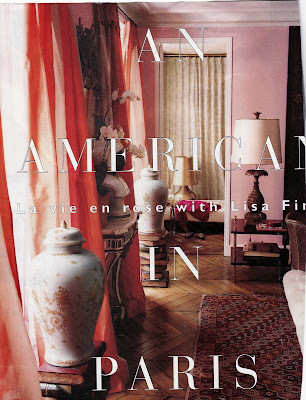 So, I was excited to recently hear from the talented man who photographed Fine's home, internationally respected Ivan Terestchenko. 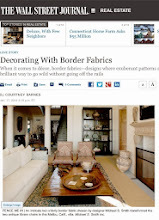 Terestchenko shared with me links to a fascinating article in the International Herald Tribune about the sale of Kenzo's Paris residence, and to his own professional site, and to his blog. Check out all three to see more of his stunning work. 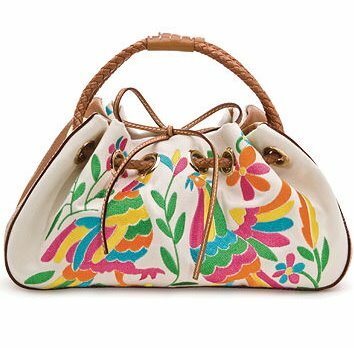 Handbag from 2006 Kate Spade collection. 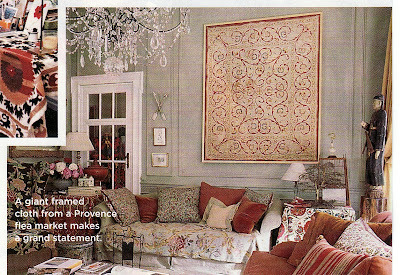 Colcha throw as seen in Elle Decor, January-February 2008, photo by Grey Crawford. 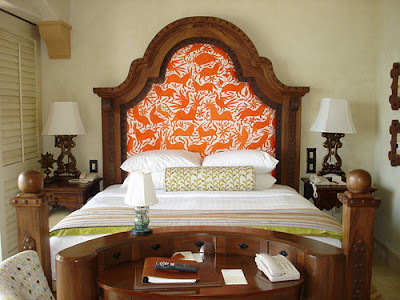 Image of headboard spotted at Palmilla from Megan Samuels. Earlier this year, over at design*sponge, the headboard fabric caused a sensation. Have you noticed these bold embroidered birds popping up more frequently? Colcha, or colcha-inspired, is the term you've probably seen used to identify them. Their heritage is Spanish. 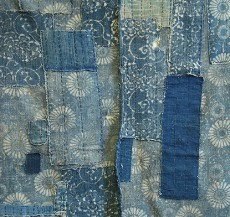 And although this colonial style of embroidery is centuries-old, I can't help wondering if it is poised to become trendy. 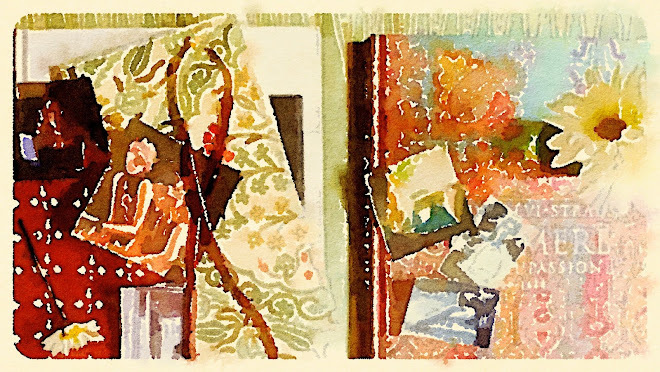 These days "colcha" is often synonymous with bed covering or wall hanging. 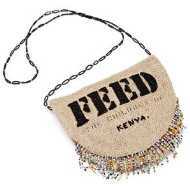 But textile enthusiasts may use the word to define a specific embroidery stitch. I've read that the Spanish who developed colcha were probably inspired by flora and fauna seen on East Indian chintz. Apparently if you are traveling in South America it's easy to find throws or textiles like the ones pictured above. Click here for other sources. According to Wendy Goodman's book, Tony Duquette, author Danielle Steele commissioned the maximalist designer to do her daughter's lavish debut party. 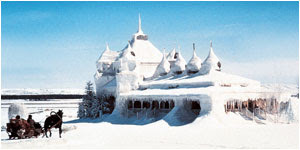 For the occasion, the famous snow scene from Doctor Zhivago was re-created complete with a ballroom within a ballroom, made entirely of French windows. Some of the windows were broken with dead tree branches poking through. "Snow was everywhere, outside and inside the ballroom, all white and crystalline. 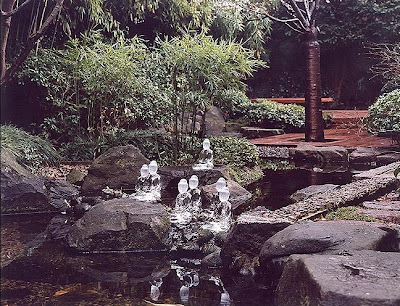 Even the votive lights on each table were made to look like shards of ice lighted from within by flame." 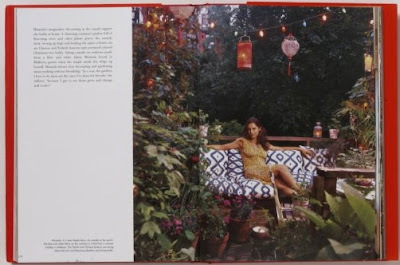 Unfortunately there doesn't seem to be an image of the party in the book, and I can't find a good one of the film scene either. (I'd love to hear from someone who has attended a party similar in design.) 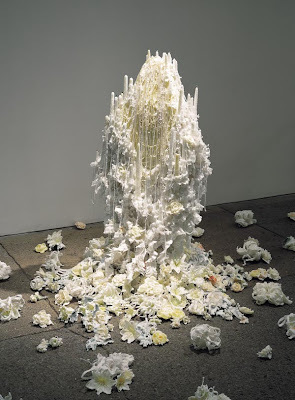 A few years ago at the High, we had a dramatic installation of Petah Coyne's neo-baroque, incredibly decadent sculptures. Although I doubt it's what she intended, the exhibit made me feel as if I was in the movie. 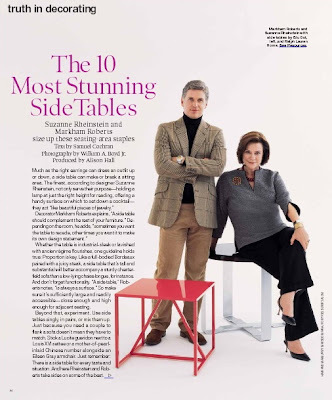 In the new January-February issue of Elle Decor, a very glamorous Suzanne Rheinstein and Markham Roberts share their picks for most stunning side tables. 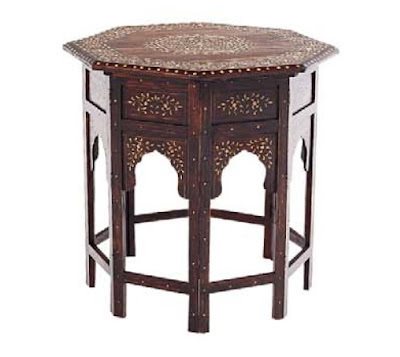 Rheinstein is especially enthusiastic about one I just love: a collapsible version of an Indian-style octagonal table with bone inlay, available through Mecox Gardens. I also want to congratulate Atlanta-based Vagabond Vintage on yet another mention in the magazine. The company's interpretation of an antique birdcage, crafted from recycled metal and sustainably harvested acacia, is featured. Fabulous green color. 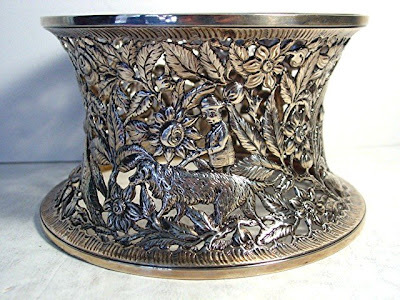 To purchase, contact Mothology or Providence Antiques. 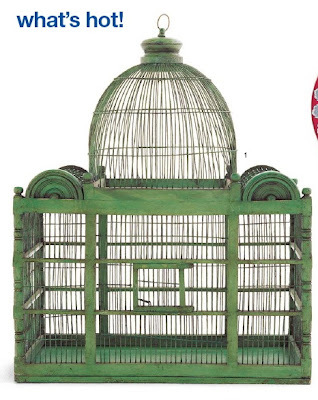 Remember the birdcage in Miranda Brooks' apartment, as seen in Bright Young Things? 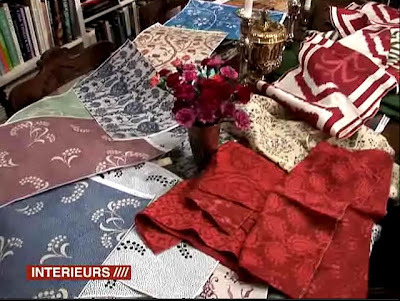 I love these images of Carolina Irving's textile-laden dining table, especially the red-and-white ikat. 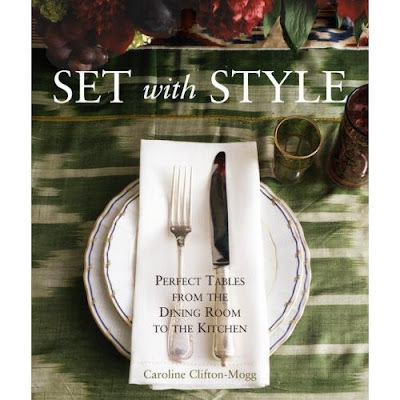 Above, an ikat tablecloth on the cover of Caroline Clifton-Mogg's upcoming, Set with Style: Perfect Tables from the Dining Room to the Kitchen. 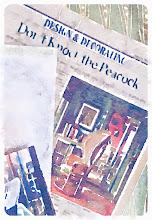 Bazaar has placed ikat on its "in" list. So we all know that pretty much guarantees next month someone will deem the fabric "out." 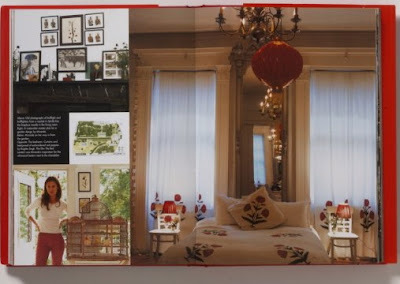 But I think it's important to remember that sophisticates such as Oscar de la Renta and Robert Kime have for years used the pattern in interiors. 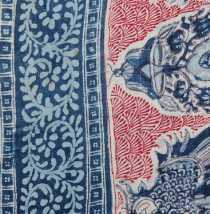 To learn more about this vibrant textile, don't forget the recently opened exhibition, Central Asian Ikats from the Rau Collection, at the V & A. 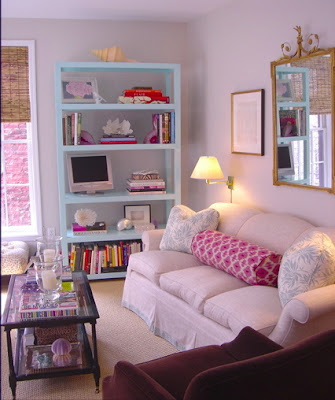 Popular consensus seems to be that eBay is actually a good source for budget-friendly ikat remnants. 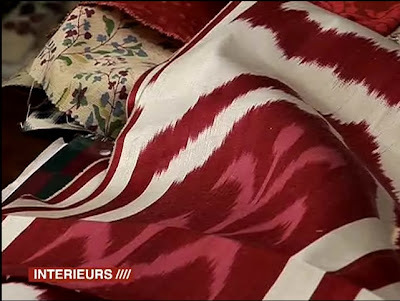 If you are in the trade, fashion designer Mert Beraze sent over a sample of ikat pillows he currently offers wholesale. (Just thought I'd share in case someone wants to investigate further.) Contact: mberaze@ugurteks.com.tr. 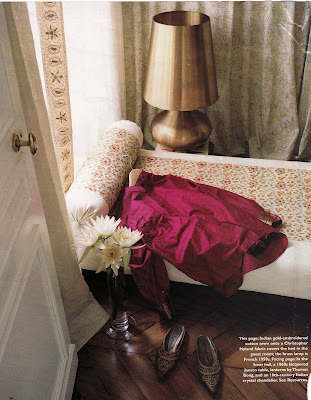 Ashley Whittaker's use of this softly colored ikat bolster is a personal favorite of mine. 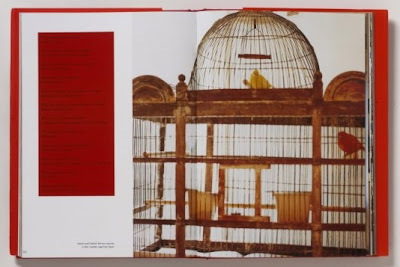 The Doris Duke Charitable Foundation, and Duke's art foundations, do something quite generous: offer free downloads of several books on her amazing collections. 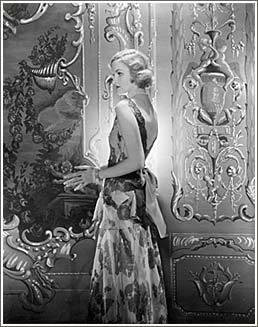 Included are, Doris Duke: The Southeast Asian Art Collection, The Doris Duke Jewelry Collection, and Doris Duke’s Shangri La. I bought a bound copy of Shangri La -- the edition that highlights Duke's Hawaiian fantasy pad -- just because it's so lovely. It is fascinating to see how ahead of her time Duke was, in terms of her taste and acquisitions. 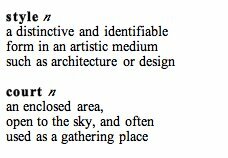 Anyone who has seen Kelly Wearstler's Domicilium Decoratus, will notice parallels between Wearstler's Southeast Asian objects and Duke's. Click here to download. 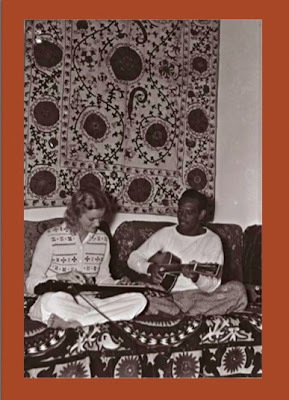 Doris Duke and Sam Kahanamoku play guitars at Shangri La, 1939. Note textiles purchased on her globe-trotting honeymoon. Image copyright, 2002, Doris Duke Foundation for Islamic Art. Recently I was treated to a sneak peek at Vintage French Interiors: Inspiration from the Antique Shops and Flea Markets of France, and I have to admit it was a serious challenge to settle on just a few lovely images to share here. The author, French lifestyle writer, Sebastien Siraudeau, is also the photographer. His lush pictures capture not only the charm of vintage pieces, but the creativity and passion of brocantuers (shopkeepers) who beckon customers with unexpected displays. Siraudeau sees the best brocantuers as new professionals, distinct from fine antique dealers and interior decorators. So, in part the book is an homage to these talented dealers. 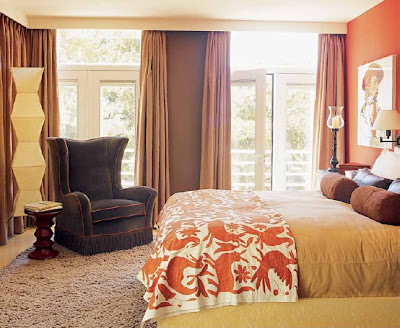 Their approach to mixing periods, textures, and colors is intended to inspire. But at the same time, the book is a very helpful guide to vintage shopping in France, encompassing diverse styles such as industrial, elegant Old World, and rustic. Chapters cover Paris in great detail, as well as France's specialty regions from Normandy to Provence. I appreciated the appendix filled with addresses, web sites, and antique fair schedules. For everyone not planning a trip to France, I think Siraudeau's photos and words will open their eyes to vintage pleasures awaiting in their own neighborhoods. 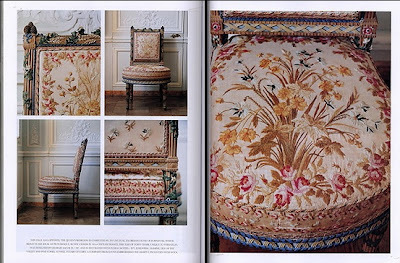 All images © Sebastien Siraudeau from Vintage French Interiors: Inspiration from the Antique Shops and Flea Markets of France, published by Flammarion. Scheduled release, March 2008. 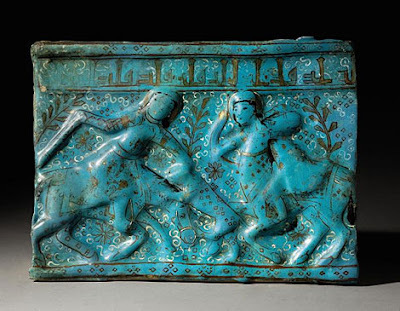 In a few days, this late 12th century Persian pottery tile will be sold through Christie's, Paris, as part of an Islamic art sale which includes Jean-Louis Thau's collection of ancient jewels from Morocco. Don't you think Doris Duke would want to snap it up if she were around today? The circa 1775 Irish silver cake ring crafted by John Craig, shown top, is a sample of the wares Shelton Gallery will bring to Atlanta in January. Get out your calendars. Design journalist, Frances Schultz, and Christie's Head of European Ceramics and Glass, Jody Wilkie, are scheduled to be among the guest lecturers at Atlanta's 37th Annual Cathedral Antiques Show, to benefit City of Refuge. Schultz will speak on Thursday, January 24, and Wilkie's presentation will take place on Friday, January 25. Both are morning events: 10:30 a.m. - 11:30 a.m. Cost is a $15 donation plus show ticket. Like I said last year, even if you don't plan to make a purchase, this is a great place to educate your eye. The Cathedral of St. Philip is located at 2744 Peachtree Road.